Since Kurt’s birthday is just a few days before Valentine’s Day, there have been years when there was an overload of sweet treats during that second week of February. This year, it was a little different since Kurt was traveling for work on his birthday. We waited and celebrated both occasions on the 14th. Of course, I questioned him in advance regarding what kind of cake he wanted this year. In early December, I read Alice Medrich’s latest book, Flavor Flours, in which she suggested the New Classic Boston Cream Pie made with corn flour chiffon layers with a rice flour-thickened pastry cream is better than the original wheat flour version. I was sure this was going to be Kurt’s birthday cake because he lives for Boston Cream Pie. Instead, he shocked me by requesting a carrot cake with cream cheese frosting. I was surprised but delighted to make a carrot cake. 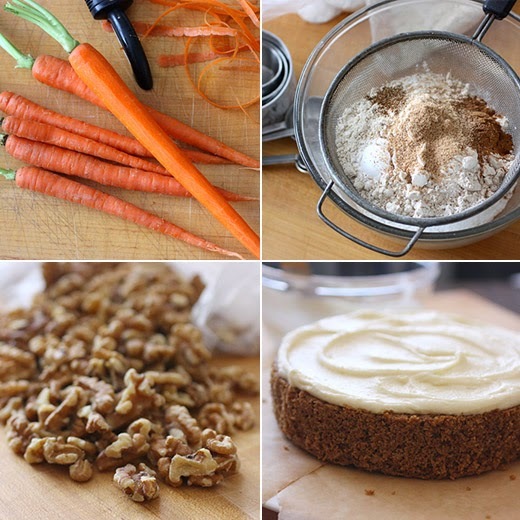 My go-to carrot cake recipe has always been the one from The New Basics Cookbook by Julee Rosso and Sheila Lukins. It includes walnuts, shredded coconut, and crushed pineapple, and the cream cheese frosting has a little lemon juice in it which I love. I’ve been making that recipe for years and never felt I needed a different approach to carrot cake. But, I decided to try something new this time. 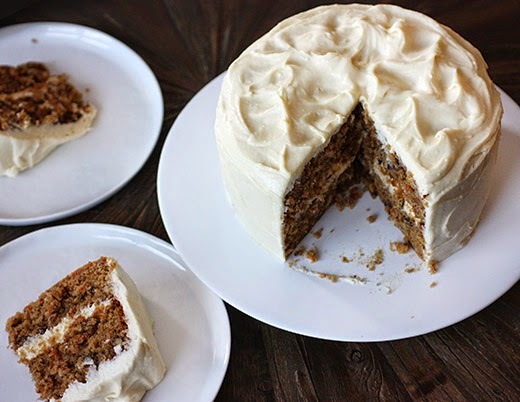 Also in Flavor Flours , there’s a Carrot Spice Cake with Cream Cheese Frosting made with rice flour and oat flour that’s touted as being a better-than-ever and gluten-free take on a classic. Now, let me explain, neither of us has any sort of gluten sensitivity, but I do love experimenting with different types of flour to discover new tastes and textures. This carrot cake is completely gluten-free, but, more importantly for me, it’s completely delicious with a delicate crumb. It seems impossible since carrot cake is usually somewhat dense, but even with the walnuts this was a light and crumbly cake. It’s very similar to my standard carrot cake recipe in that it’s made with vegetable oil rather than butter, and that’s mixed with sugar and eggs. Rice flour and oat flour were combined with baking soda, baking powder, cinnamon, freshly grated nutmeg, ground cloves, and salt. The dry ingredients were mixed into the wet, and then grated carrots and toasted, chopped walnuts were added. Thanks to perfect timing, I had just received a bunch of fresh carrots from our CSA that I shredded for the cake. I baked the cakes in eight-inch round pans and let them cool. For a layer cake, one and a half times the recipe for frosting is needed. 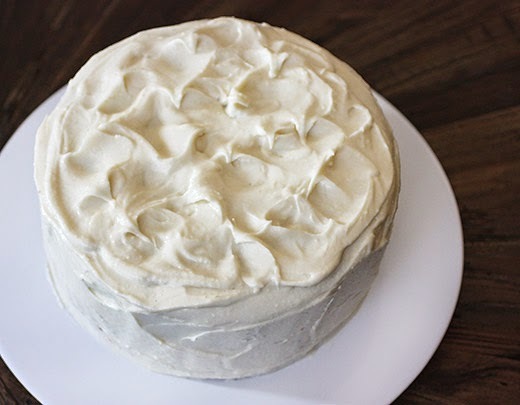 The frosting recipe here includes cream cheese, butter, confectioners’ sugar, and vanilla, and I added lemon juice because I can’t give up that detail of my usual carrot cake approach. One thing to keep in mind with this cake is that because it is especially crumbly, it definitely requires a crumb coat of frosting. I scooped some of the frosting from the big bowl in which it was mixed into a smaller bowl to use for the crumb coat. That way, any crumbs from the spatula will only get mixed into the crumb coat frosting and not into the entire batch. Chilling the cake after applying the crumb coat is a good idea since the frosting will set more firmly. Then, the pretty final coat of frosting can be applied. This version didn’t have the shredded coconut or crushed pineapple that I’ve become used to in a carrot cake, but I liked that leaving them out eliminated some sweetness. Mostly, I really liked the tender, crumbly texture and the flavor from the spices and nutty oat flour. It really was amazingly the opposite of dense given that it was a carrot cake. Kurt was very pleased with his choice as well, and I now have two favorite carrot cake recipes. If I’d been asked a few weeks ago what I knew about Lebanese food, I would have said that I didn’t really know anything. It turns out, I’ve been enjoying the flavors of Lebanese cooking for years without even realizing it. I received a review copy of the new book Comptoir Libanais: A Feast of Lebanese-Style Home Cooking by Tony Kitous and Dan Lepard and started learning a thing or two about this wonderful food. Kitous opened the London restaurants Comptoir Libanais to share Lebanese culture through the food, the look and feel of the dining rooms, and the design of every item seen throughout. He set out to create “something that wasn’t pretentious but inviting, simple, and that had something for everyone.” I’d love to visit one or several of the locations. A mix of mezze dishes like Tabbouleh, Fattoush, Labneh with Black Olives and Mint, Sambusak turnovers, and Falafel might be found on the tables. Some of my favorite ingredients like halloumi and feta cheeses, pomegranate seeds and pomegranate molasses, and sumac and za’atar figure prominently in many of the recipes. I can’t wait for ripe, summer tomatoes to use in the Comptoir Tomato and Halloumi Salad and zucchini to turn into crispy fritters. So far, I’ve tried the Bulgur Salad with Peas and Mint which is a good choice for winter since it’s topped with pomegranate seeds and can be made with frozen peas. Like classic tabbouleh, this salad is as much or more so about the mint and parsley as it is the bulgur. Next, I tried the Fatayer with Cheese and Spinach which are filled, savory pastries. They’re made with Sambusak Pastry that’s like pizza dough minus the yeast. The dough is very easy to work with, and it’s used for a few different recipes in the book. To start, water, flour, olive oil, honey, and salt were stirred together in a bowl. It was set aside to rest for about 10 minutes, and then it was kneaded until smooth. The dough easily goes from ragged to smooth while kneading. At this point, the dough can be refrigerated until you’re ready to make the pastries, or it needs to be set aside for an hour to rest before using. Next, spinach was cooked in olive oil until wilted and then drained, cooled, and squeezed to remove excess moisture. The cooked spinach was chopped and then combined with toasted chopped walnuts and pomegranate molasses. The dough was divided into small pieces, and I aimed for 20 pieces which was the number this recipe was intended to make. The dough pieces were rolled into balls and left on an oiled plate. 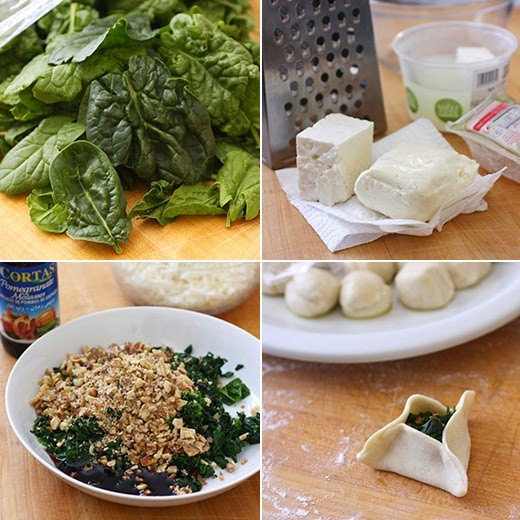 One piece of dough at a time was rolled into a circle, and a spoonful of spinach filling was placed in the center. The edges of the dough circle were rubbed with water, and the dough was pinched up around the filling forming three points with the center left open. Once all the dough circles were filled and crimped, the cheese was added on top. I used a mix of grated halloumi and crumbled feta. The cheese mixture was spooned into the opening of each pastry, and then they were topped with black onion, or nigella, seeds. The pastries baked for about 30 minutes until golden and crisp on the edges. As an option, mozzarella can be used in place of the halloumi. That would have made the filling more melty and gooey in a delicious way, but I can never resist the salty flavor of halloumi. These little savory pastries were crunchy with crisp edges on the outside and the nuts in the filling. The pomegranate molasses added just the right amount of tanginess and interest. Like all of the dishes in the book, this was perfect for sharing with a group or serving at a party. And, since the Breakfast chapter has caught my eye, it might be time to plan a brunch party. Recipes reprinted with publisher’s permission from Comptoir Libanais: A Feast of Lebanese-Style Home Cooking by Tony Kitous and Dan Lepard. Copyright © Tony Kitous and Dan Lepard, 2013. Published on November 19, 2014 by The Overlook Press, Peter Mayer Publishers, Inc. www.overlookpress.com. All rights reserved. Fatayer are usually triangular-shaped pastries, either sealed at the top or left open. Sealing the edges of the pastry at the top protects the filling so it’s perfect or you can leave the top open the way we do at Comptoir and pinch the edges of the filled fatayer to form a triangular shape as in the photo here. If you sprinkle a deep layer of cheese on top before baking, any filling underneath is protected from the heat of the oven, allowing the pastry to be crisp but the filling soft. Start by preparing and resting your dough (see p. 82). Preheat the oven to 350°F (180°C/160°C fan/gas 4). Line a few baking sheets with parchment paper. Make the filling by heating the olive oil in a large frying pan until smoking hot, then add the spinach and fry quickly until it just begins to wilt. Tip the spinach into a colander and set aside to cool, then squeeze the cooked spinach as hard as you can to remove the liquid. Chop the spinach, then place it in a bowl with the walnuts and pomegranate molasses, and mix well. Chop the dough into small pieces, about the size of an unshelled walnut, then shape these into balls and set aside to rest on an oiled plate, covered, for 15 minutes (this makes rolling easier). Roll out each dough ball on a lightly floured or oiled surface to about 3 inches (8cm) wide. Place a heaping teaspoon of the spinach filling in the center of one, then with the tips of your fingers rub a little water around the bare edges of the dough. At 3 equal points, pull the dough up 1/2 to 3/4 inch (1 to 2cm) and pinch the dough together to seal — you should have created a protruding edge around the filling. 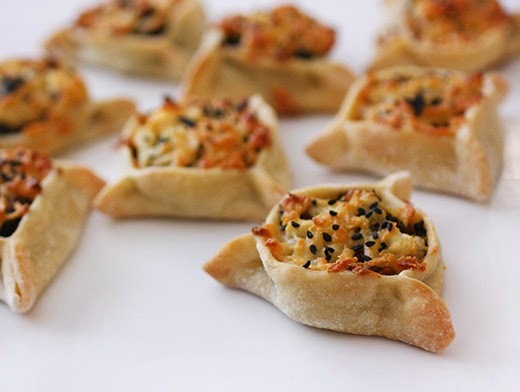 Spread the cheese over the filling, then top with a pinch of mint, sprinkle with the black onion seeds or za’atar, and place on the lined baking sheets. Repeat with the remaining dough and filling, then bake for about 30 minutes, until crisp and golden, rotating the baking sheets if one batch looks like it is browning more quickly. Little pastries filled with a variety of ingredients, from chopped herbs and soft cheese to meat, walnuts, or chicken, can be found throughout the Arab world, under different names. 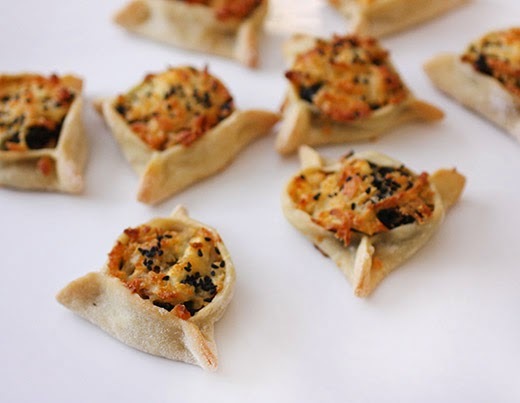 These cheeky little savory parcels have a delicious filling tucked inside and can be served either hot or cold. They freeze well, and because they’re so small they can be reheated easily. You want a flour that produces a dough that stretches easily, and bread flour will do that. However, this can make the pastries a little tough and not as tender as the ones we have at Comptoir. If you want to experiment, use half bread flour and half all-purpose flour or half Italian pasta flour, as this will give a more tender result. Pour the water into a bowl, then add the flour, olive oil, sugar or honey, and salt and mix everything together well. Aim for a firm-ish dough, adding more water or flour to get the texture you want. Cover the bowl with plastic wrap, set aside for 10 minutes, and then lightly knead the dough. Return it to the bowl, cover again, then set aside for about 1 hour at room temperature and it’s ready to use. If you want to make the dough ahead of time, you chill it at this point, then leave it at room temperature for 1 hour before shaping. Some basic tips for making the best pastries: roll the dough very thin, otherwise you end up with too much pastry surrounding the filling. I use a little flour, as oil sometimes stops the edges from sealing firmly, but figure out what works best for you. The dough will keep well in the fridge for a few days, and gets easier to roll, but it will change color and go slightly gray. This is just the flour oxidizing and it won’t affect the flavor. You can also freeze the dough. Simply thaw it and return it to room temperature before using. Have you heard about the Wonderbag ? I’m fascinated with its ability to slow-cook food with no power source. It was invented by Sarah Collins to reduce the need for wood fire cooking, free up time spent tending to meals, and lessen smoke inhalation from indoor live cooking fires. There is a one-for-one program, and for every Wonderbag purchased in the US, one is donated to a family in need in Africa. I received one as a sample for review. I’d like to quote a few interesting facts: “Smoke inhalation from wood fire cooking is the leading cause of death globally. More than 50% of premature deaths in children under five are related to household air pollution. Each Wonderbag saves 1.7 trees, 1,000 liters of water, and 1,248 hours of time not spent collecting firewood.” This is a genius tool for families that use wood fire for cooking, and it’s also incredibly useful and eco-friendly for families who cook with gas or electric stoves. It operates much like any slow cooker in that you can leave a dish for hours, but the dish needs to be heated to a boil first. The bag is made of washable fabric that’s filled with repurposed foam chips, and a drawstring pulls it tightly closed. It’s perfect for cooking things that would usually spend a long time on top of the stove or in the oven. Grains, beans, stews, and soups are all great examples of things to cook in a Wonderbag. And, a small recipe book comes with it to help get you started. A couple of things to keep in mind are pot shape and pot size. First, you’ll want to use a heavy pot with short handles that also has a lid. A long-handled pot won’t fit into the bag. Also, you’ll want to choose the right size pot for the volume of what you’re cooking. If the pot is too large and there is air space above the surface of the contents, the temperature will drop too quickly. 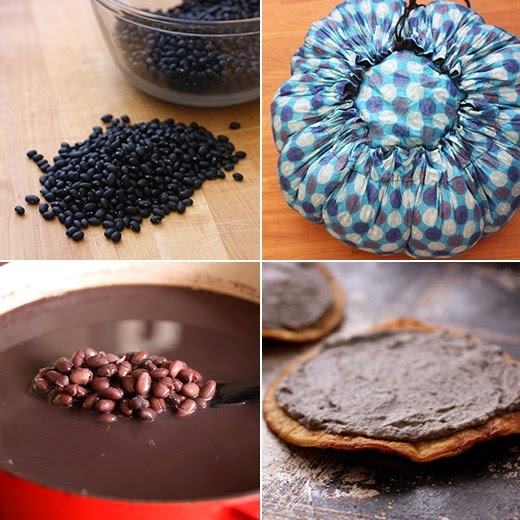 My first use of the Wonderbag was to cook black beans, and it worked perfectly. I soaked the beans overnight. The next day, I drained them and cooked them in fresh water in a Dutch oven. The water was brought to a boil and allowed to boil for 15 minutes. Meanwhile, I skimmed the foam from the top. After 15 minutes, the lid was placed on the pot, and the pot went into the Wonderbag. You do need to place a trivet or a folded towel in the bottom of the Wonderbag so the pot doesn’t burn the fabric. There’s an insulated lid that fits over the pot, and the drawstring pulls the edges of the bag up and around the fabric-covered lid. I left the beans to slow-cook for about four hours. When I opened the bag, the pot was still very warm and I had beans that had cooked through completely without a stove or any energy source. I love stocking my freezer with two-cup portions of cooked black beans to use for tacos or to serve with quinoa. And, I used some of the black beans to make refritos. I always follow the recipe from Hugo Ortega’s Street Food of Mexico for refried beans. The cooked beans are pureed in a food processor and then stirred into minced onion that’s been cooking in olive oil. 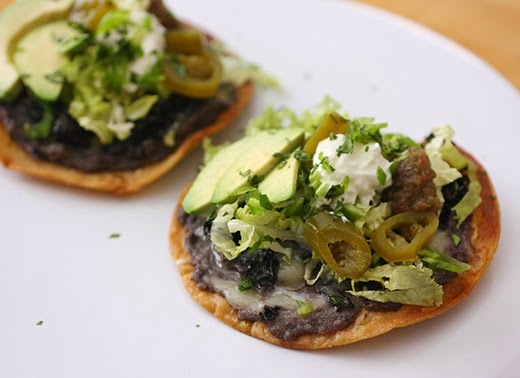 I used some of the refritos for Super Bowl nachos, and the rest were layered onto crispy tostadas. To make tostadas, I fry corn tortillas in a little canola oil and drain them on paper towels. And, then the toppings can go in all kinds of directions. 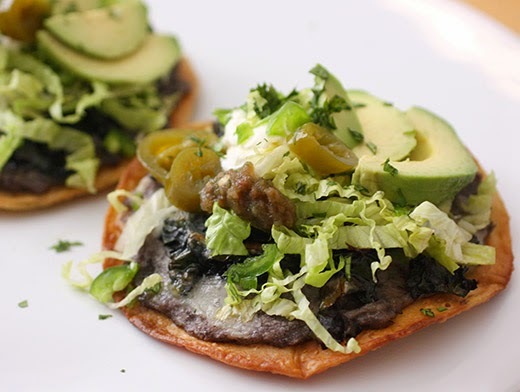 The version shown here included refried black beans, sauteed red kale, and shredded Monterrey jack cheese. After those three toppings were in place, I broiled the tostadas to melt the cheese. Then, sliced fresh jalapeno, chopped lettuce, sour cream, salsa, avocado, and pickled jalapeno were added. For a different take, a fried egg would not be out of place at all positioned somewhere between the melted cheese and the avocado. In that version, I skip the lettuce and sour cream. I definitely have a new way of cooking beans, and I look forward to trying other things in the Wonderbag too. Another recipe in the booklet is for homemade yogurt. I need a small enough pot with short handles to make that work, but I can’t wait to do it. I was thrilled with my experience cooking with it, and that pales in comparison to what it offers for families who cook with wood fires.